Our childhood imagination that made a backyard tree house or playhouse so much fun is still alive in all of us. It’s just that as adults, we’re more practical about it. 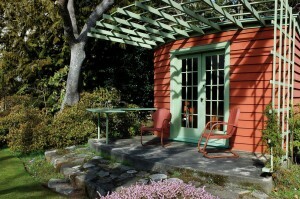 Bring back that youthful creativity and transform a utility structure into a place to call your own. Let’s face it: sometimes we dream about having our own haven where we can exercise, or make crafts, or work, or even just socialize with a couple friends without stepping on Legos or shouting over a blaring television set or having family members pass through dropping all the wares of their day in our special space. 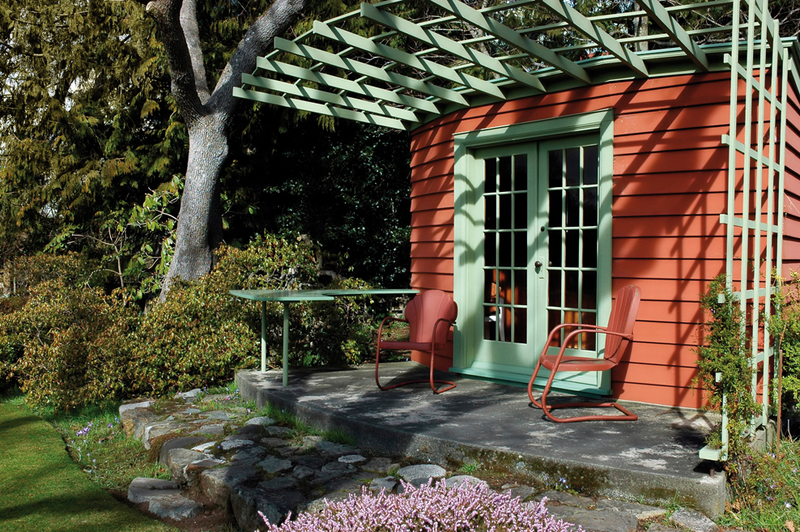 A backyard shed could be the solution! Now available in more architectural styles than ever before, the garden-variety garden shed, if you will, now has many different uses. Pete Foss, owner of Valley Structures in Lynchburg, said although the basic garden shed is still requested by about 80 percent of his customers who need an answer to their outdoor storage problems and a place to keep their tools, he does have customers request specialized sheds for alternate uses. And those uses may surprise you. “I’ve known people to make them into pool houses, aviaries for their birds, game rooms with a bar and billiards, workout rooms, artist studios for painters and musicians, pet sanctuaries with kennels, and hunters even use them as cabins. It’s pretty amazing what people come up with,” he said. 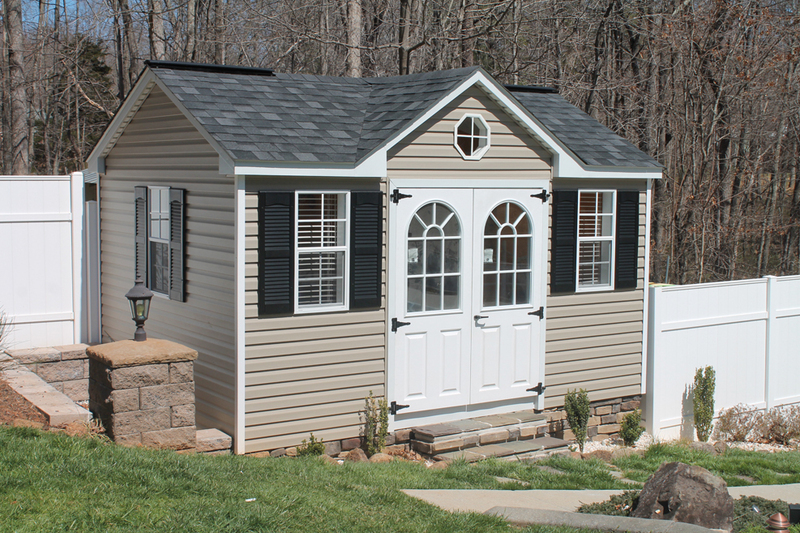 Now with so many options for size, doors, windows, angled roofs, and even electrical and plumbing, some people are choosing to construct a backyard shed to house their hobbies. These buildings may cost anywhere from $1,000 to $10,000. 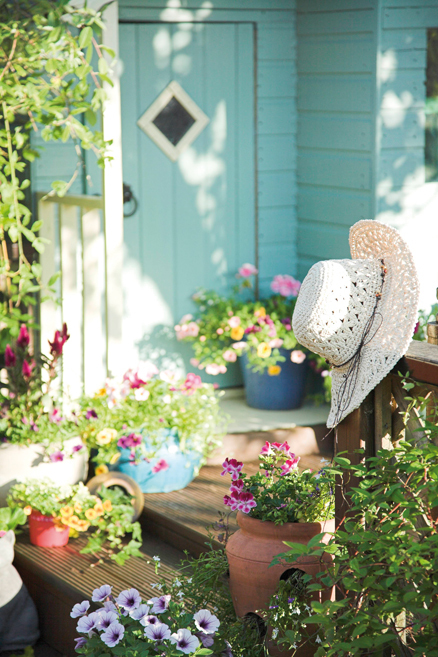 Take a look at the options available for sheds today and you may find why these stylish outbuildings are making their way into more backyards. Nowadays, the styles of sheds can range from a very traditional carriage house; to a modern chalet with a peaked roofline and elaborate trim; to a resort-like villa. There’s even a two-story cottage with Williamsburg-style dormers—a perfect compromise for couples, where each can have their own level, keeping hobbies separate but enjoying the space together. Even simple barn and A-frame-style buildings come with interesting details and options. People can closely match the look of their home and really pick and choose what they want to customize it and make it their own. Once a style is decided, size is the next big factor to consider. The structures are ordered in 2-foot increments (for instance, a basic A-frame can range from 4-by-6 to 14-by-36). Foss advises that you discuss your structure’s intended use with a retailer because they know what works best for a particular purpose. For example, a 12-by-20 building is the minimum size recommended for a woodshop because if you go smaller than that, it will be difficult to work with a full sheet of plyboard. If you hope to use the space to rebuild a vintage car, you will need room for a workbench, enough height to open garage doors, and ample space to navigate around your vehicle with tools as you work. So, perhaps you’d need a 14-by-28 shed for your workshop. If you dream of having your own home gym and plan to place a weight set out there, retailers will need to know your plans so they can reinforce the floor for adequate support. Another factor you’ll want to consider is the exterior siding. Wood or vinyl options are popular (again, you can match the color and style of your own home if you’d like), but there is also a board and batten option, and a cement siding that provides more durability and insulation. Then come the extras: there are an abundance of window and door styles, different types of shutters, and even shelving, skylights, vents, ramps, window boxes and porches. 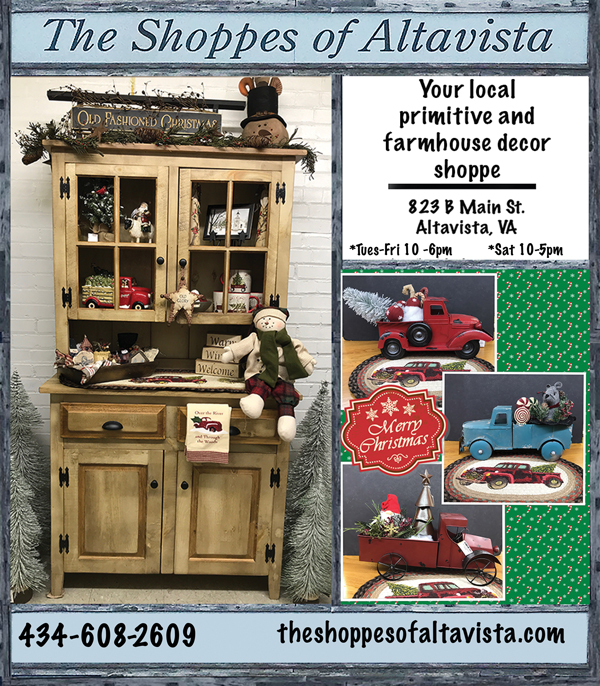 Although sheds can be outfitted with electricity, Foss said one of the most popular ways people customize sheds is to request more windows and doors, to let more light in and sometimes even avoid an electric hookup altogether. 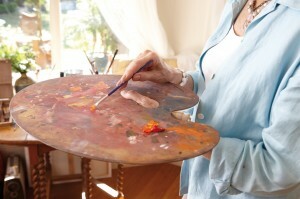 Artists, he said, have ordered buildings with windows on every side so they can work while bathed in all-natural light. Chalets and sheds featuring dormers are popular styles for this reason. Buildings can be ordered with electrical wiring already installed, but you will need an electrician to attach the fixtures. Ordering the building with wiring is not recommended unless you plan on finishing the interior walls. People always want to know if a building permit is needed for utility structures. In many cases, if the structure is less than 200 square feet (and doesn’t have electrical or plumbing installed), you may not need one. 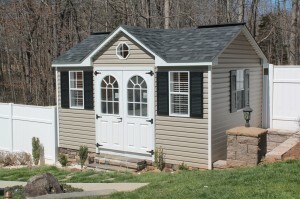 Any shed larger than 200 square feet will likely need a permit and it will need to be anchored to the ground as well. 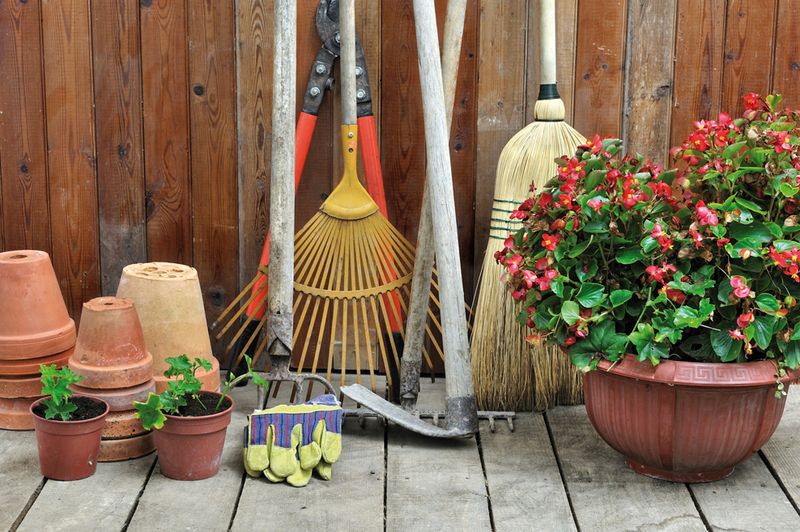 Sheds larger than 250 square feet may require footers. Localities have different requirements and zoning ordinances. Retailers can work with customers to make sure all the requirements are met during installation. 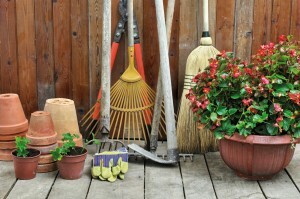 They can also recommend electricians, plumbers and landscapers. Set-up and installation of a shed is fairly quick. For buildings leveled on block and not requiring anchors, it can take as little as 30 minutes; but when buildings require footers, setup can take a couple of days. Keep in mind that a factory-ordered, customized structure can take up to three weeks for delivery. Still, if you’ve ever been through a massive renovation or put on an addition, the time frame for placing a backyard shed will seem like no time at all! With the exchange of ideas the Internet allows, there is no shortage of inspiration to help you decorate your special space. 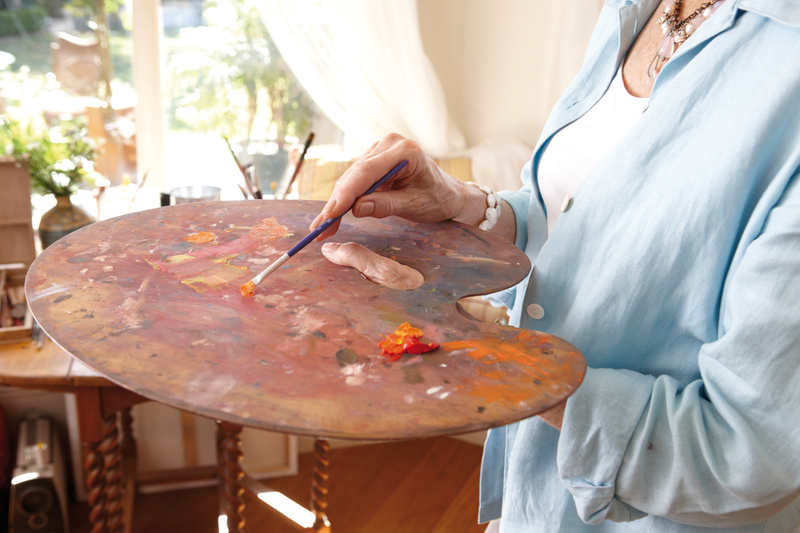 Like rooms in a home, you can choose a theme and decorate from the inside out. 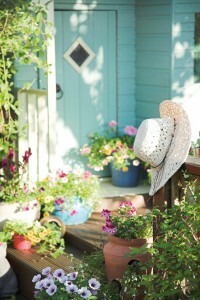 One place where creative ideas converge from social media, blogs, and decorating gurus is www.scoop.it/t/garden-sheds. Here, you can find ideas about how to decorate with antiques (think cozy cottage with a whitewashed, distressed look on the walls and cabinets); create a gardener’s delight with vines, trellises, and birdhouses; or paint the exterior with the color and logo of your favorite sports team to customize your man cave! If you decide to finish off the interior, Foss recommends using OSB, a type of sub wall, with insulation. He advises against using drywall because if the structure ever were to be moved, its finish could crack. Many people add paneling over the OSB and then paint or paper the paneling as they desire. On the outside, depending on what type of installation your building requires, you may be able to install a rock foundation or use shrubbery to cover any open areas underneath. Some people choose vibrant paint colors to attract attention to their building, while others prefer an unfinished, natural look and allow vines to meander around and provide camouflage. Some will add a fountain, rock garden, rows and rows of flowers, and dainty furniture, while others will add a simple paver pathway leading from their home. A personal space is about personal style, so it should reflect your own. Foss reminds all his customers that the buildings are like their home and must be maintained. “If you let it go, you’re going to have problems down the road—it will start to look rundown,” he said. A roof should be replaced every 15-20 years and homeowners should keep an eye on the shingles for leaks, add fresh coats of paint when the structure shows wear, and seasonally clean it if it is vinyl. To protect your siding, don’t prop tools or equipment against it, which can trap moisture and also encourage hideouts for critters. Unlike your home, however, these buildings can be remarkably portable. “The best thing about these buildings is they are made to be set down and picked back up again,” Foss said. So, even if you pack up and move, you can always take your special space and move it with you.